I am living the true modern gaming experience these days when I fill the empty moments during Assassin’s Creed Odyssey load times by playing the mobile game Assassin’s Creed Rebellion on my phone. I won’t keep this up for long. Rebellion is too much of a Modern Mobile Game for my taste, but I’ve discovered I’m a sucker for its revival of some classic Assassin’s Creed moves. Play AC Odyssey and some might argue you’re not playing a true Assassin’s Creed game, what with how the designers keep bending the rules for the series-enabling memory-diving Animus tech system or how, you know, Odyssey doesn’t have you playing as an Assassin and is set before the creation of the Creed. Maybe, maybe not. What makes for a true Assassin’s Creed experience is now a perennial gaming debate, a la whether Mario (the plumber, not Auditore) is better in 2D or 3D. What makes Rebellion a game that I’ve given more than a few minutes of my time to, though, is that, wow, it has haystack assassinations. It’s by no means a classic Assassin’s Creed game—and a big warning to you that it is very much the typical annoying not-really-free mobile game—but it sure has some classic AC tropes. I didn’t realize how much I missed them. 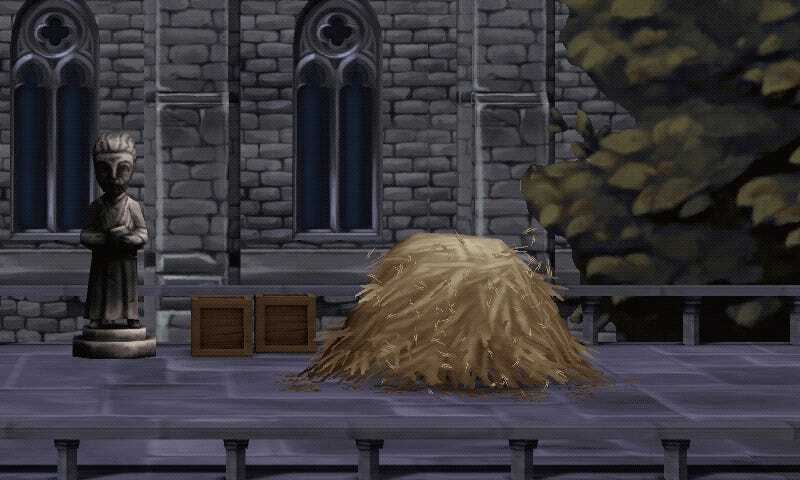 Take the haystack assassinations that used to be omnipresent in the console games and are now a rarity. They’re abundant in Rebellion’s side-scrolling levels, as are other opportunities for the kind of stealth moves that are scarce in the likes of AC Odyssey and last year’s Origins. You can creep into an area where a guard is on patrol, jump into a haystack, wait for them to pass and then leap out and stab them. You’re a master assassin, after all. You can also throw coins on the ground to lure enemies in for the kill or to distract them so you can sneak past. These are classic moves, and they’re the kinds of things you actually don’t see anymore in the big Assassin’s Creed games. Sure, 2017’s Origins and 2018’s Odyssey are fun and beautiful and allow our heroes to sometimes kill their enemies with deadly leaps from above, but they’ve moved further and further away from the series’ staple move set. In the big games, you’re no longer blending in with crowds and you’re not really doing much parkour to surprise opponents. Arguably, this is justified by the era in which the games take place, back before the whole Assassins and hidden blade stuff was a global trend. It’s this mobile game that is currently representing anything close to that classic Assassin’s Creed stealth-assassin style of gameplay. It doesn’t do the crowd-blending thing, but it does let you command an expanding Brotherhood of little assassins to leap and stab in the most quietly lethal ways possible. It encourages players to approach each encounter like an assassin and use haystacks to their fullest. Fans of the older Assassin’s Creed stuff shouldn’t get too excited. Rebellion isn’t remotely like the classic Ezio trilogy or any other AC game. It’s not an big open-world adventure. It’s a 2D mobile game that involves base-building, gear-creation and quasi-turn-based battles involving an assembled crew of assassins and other fighters, all wrapped into the standard eye-roll of mobile game monetization that turns everything into a test of your patience versus your willingness to spend money. It’s possible to have fun with the game, but it’s also possible to just get angry at the absurd grind tied to nearly anything you want to do in the game outside of playing its very basic levels. In fact, more cynically, the haystack assassinations work as fan service, as does the opportunity to obtain Assassin characters from throughout the franchise—Ezio! Shao Jun! Kassandra! Etc—all of which require the same tap-tap-tapping, wait-wait-waiting and/or pay-pay-paying. I am at least tickled to see the haystack assassinations. I am into controlling a character who is trying to be a stealthy, hooded killer, and that’s got me agreeing more than I expected to with the Odyssey naysayers who are unhappy with how little of the old Assassin-style play is in the newest of the big games. I like Odyssey a lot, but I’m suddenly getting the itch to go load up one of those classic Assassin’s Creed games or carve out time for next March’s remaster of Assassin’s Creed III. I never expected it’d be a game like Rebellion that would make me hungry for the classic Assassin’s Creed.